Swipe telecommunications and MTV has yet again launched another product in India. 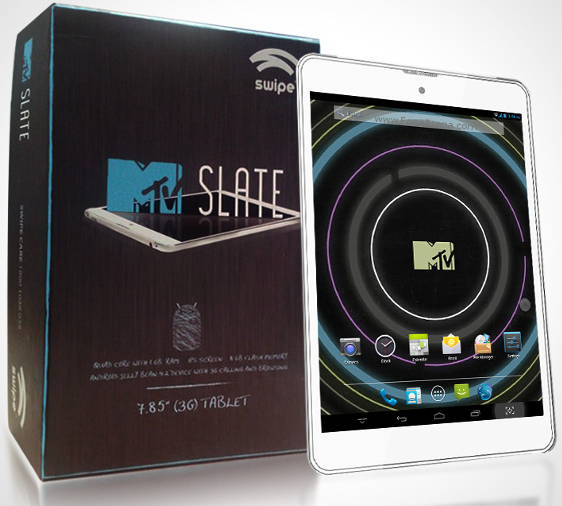 This time company has moved up from the phablet market and has come up with a 7.85 Inch Tablet, MTV Slate Priced at Rs.14,999 . The last phablet from swipe in India was Swipe MTV Volt 1000. This tablet is powered by a 1.2 GHz Quad core processor which is based on cortex A7 architecture. The rival Google nexus 7 comes with a slightly better processor based on A9 ARM architecture. The RAM capacity is standard at 1 GB. The Internal memory is 8 GB which can be further expanded to 32 GB using MicroSD architecture. The camera of 5MP is pretty impressive. Swipe has taken the camera features seriously unlike other Tablet manufacturers. A front camera of 0.3 MP is also available for video calling. The battery capacity is 3200 mAh which is less than what we expect at this price range, Simmtronics Xpad Mini and Asus Google Nexus 7 both provide with a better battery capacity. Connectivity features include 3G, WiFi, Bluetooth 3.0, GPS and 3.5 mm audio jack. Asus will soon bring its next gen Nexus 7 with 2 GB RAM to India hopefully by the end of this year. This tablet too will provide a very viable option for a couple of thousand more. The Simmtronics XPad Mini is offering similar specifications at a cheaper price of 9,999 INR. This tab will also receive fierce competition from Samsung Galaxy Tab 3.0 7 inch and Asus Google Nexus 7 in India. Seeing all this you can safely conclude that Swipe has landed its ship in fierce water this time and will have to struggle for that chunk of market share. Outstanding features that too at an affordable price. Wow! Swipe tablets you guys have made the best of tablets at reasonable prices.This tab will be a treat. An Impressive tab with all the terrific features I would need .Plus elegantly built both in terms of looks & Features it’s a premium Device. The Swipe MTV Slate is a great tab with all the features I would need .Plus added bonus of not spending a lot of money on it Thank you swipe.